​Eastern Coyotes CeAnn & Loki have made their journey across the Rainbow Bridge, but not before first gifting us with four healthy pups in the spring of 2012. Denahi, Sitka, Kaliska, & Kenai were born here at the center in a natural den created by CeAnn and at twelve days old were removed by trained staff to begin their socialization process with humans. The four have grown into beautiful adults and currently reside within two enclosures. 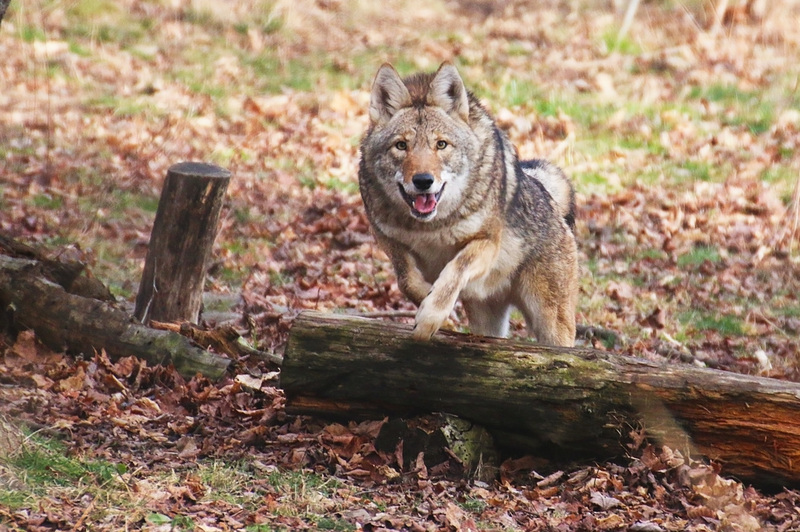 '"For the past five and a half years, I have been observing our captive Eastern Coyotes pack behaviors, pack dynamics, social structure, feeding behaviors and inter pack relationships. The factual information that I have gathered I am open to sharing with people in the hopes that authorities, communities and individuals will learn to coexist with these highly intelligent animals that have become part of our environment. For myself, as someone who loves watching animal behaviors and studying ethology, this has been an ongoing. absolutely incredible experience. To learn from the very best teachers, the animals themselves, has been an amazing and humbling experience. In New York State and just about other State that has a coyote population, Eastern or Western, coyotes are viewed as varmints and a "nuisance" animal. I live in an area where the opinion of most people is that coyotes should all be shot. I recently had a conversation with a friend and former regular volunteer here at Wolf Mountain who now works at an area zoo, about the attitudes towards coyotes in our area. In many ways, the anti coyote rhetoric and actions are not very different from that which occurs with the wolf. These have been difficult animals to work with in a captive situation. A number of times over the years I have asked myself why did I bring these critters on board to the Center. They are hard to manage, are amazingly smart, high energy, athletic, and they have frequent family feuds. That said, the impact that these beautiful, intelligent animals have made on visitors has been unexpectedly positive. Seeing, learning and hearing them vocalize has changed many opinions. These are the same animals that live nearby, that people speak negatively about, and the same animals whose haunting howls in the stillness of the night I misunderstood. I recall a hunter of coyotes saying to me after one of our programs that the next time he has a coyote in his cross hairs, he will just look at it, he will not pull the trigger. That's why I continue to work with these amazing animals, I might go through a few more sweatshirts and pants then on my rounds with the wolves and arctic foxes. I know now why most facilities and zoo's don't want to exhibit eastern Coyotes!! Still, I respect them and admire their attitude. We are trying to do our part to educate people and to give honor to our trickster brothers and sisters. * Pups are born in April. Litter size 3-6. About 60% of pups do not live past their first year. * Surviving young will disperse from natal pack by the next breeding season leaving only the mated pair. * Significant amount of "inter-tribal" disputes within pack. This is a major contributor to dispersal and smaller pack sizes. Pack size 2-6. * Will defend their territories (5-10 square miles) from neighboring packs. * Vocalizations are extensive and each animal will sound like five. 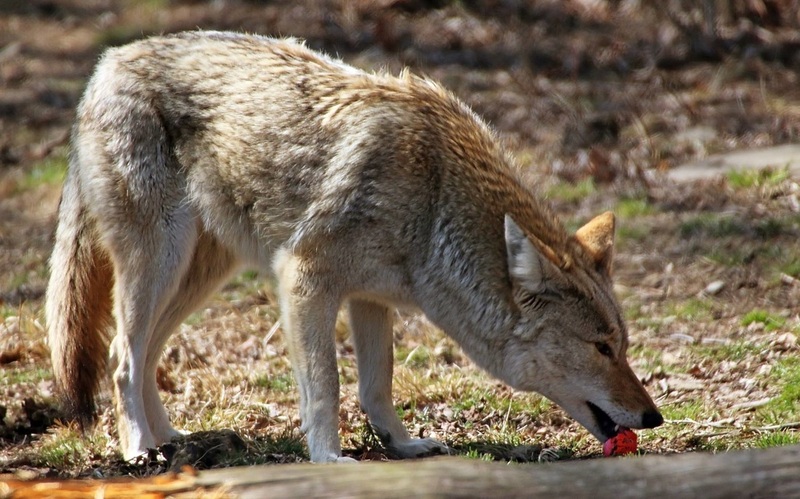 * Many Eastern coyotes have Red Wolf DNA. "Coy dogs" are extremely rare or non-existent. * MENU: What's for lunch? Diet is mostly mice, moles, voles, birds and bird eggs, snakes, woodchucks, rabbits, squirrels, beavers, muskrats and pond life. Adirondack Eastern Coyotes diet in summer is more than 50% beavers. They will prey on deer fawns for a few weeks in the spring as nature planned it. Adult deer that have been compromised will be taken out, also those injured by vehicles, wounded by hunters, the old, sick or occasionally barbed wire injuries. * Coyotes often seen during the day after farmers plow fields or after hay fields have been mowed. This situation creates an "all you can eat" buffet! * Human attitudes & activities, vehicles, hunting and trapping or injured/killed by other coyotes. * Eastern Coyotes are NOT a threat to humans. Humans are not on the menu. * May occasionally kill roaming cats and small dogs. Some have killed domestic livestock but the number is extremely small. Livestock fed upon by coyotes were almost exclusively scavenged discarded animals, farm dumps for example. * The Great Horned Owl, Bald Eagle and Red Fox are more likely to kill cats, small domestic and farm animals then are coyotes. * People can coexist with the Eastern Coyote. * Please visit the SUNY ESF website for more detailed area research information. Did someone say "dinner time?" Yes, Coyotes loves eggs! Even colored ones! "Hunting" for food in the trees!